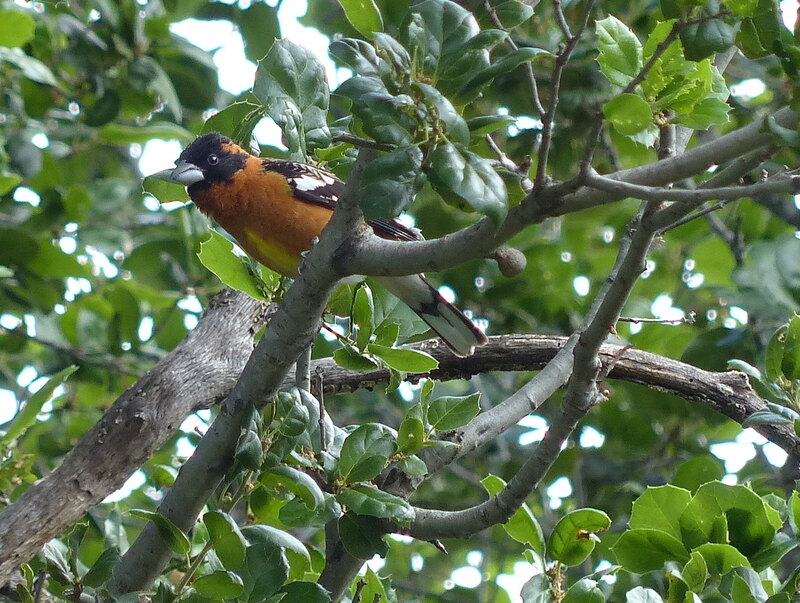 I’ve been waiting for our hobo Black-headed Grosbeak to ride the Spring Migration rails through town, and he finally showed up. We saw him northbound last April, and heading south in September. He’s only around for a day or two, and I might have missed him but we had (people) visitors in town, and I’d taken a day off and consequently was enjoying a leisurely breakfast on a weekday when one of the Visitors said “hey!”, or something along those lines. Looking outside the dining room window, there was our Grosbeak. This time, just the man version. Last two visits it was a lady and a gent, so he must have said something wrong and now she’s had it with him. I had hoped that they might have logged our feeders as a reliable way-station on their long journey, much as we do with Casa de Fruta on drives down Interstate 5 to LA, or Knights Ferry on trips to Yosemite. Third time’s a charm, so I expect now to see the Grosbeak stopping by sometime in the third week of September. They spend the winter in Mexico, in the same area where the Monarch butterfly winters. I just learned that they are one of a few birds that can eat the Monarch, which has self-defense toxins. Apparently they have to wait 8 days in between eating Monarchs, to allow the toxins to clear. How do they know 8 days have passed? I just planted milkweed to attract Monarchs, so this will provide even more incentive for the Grosbeak to return. The other cool bird thing that happened this weekend involves the Dark-eyed Junco. We’d been seeing a pair hitting the backyard feeder pretty hard lately, which isn’t normally their thing. The Junco likes to forage on the ground, so it was an unusual sight to see them among the lollygagging Finches who dominate the feeders. But late yesterday afternoon, as we were at leisure on the backyard deck, the Resident Expert noted some particularly noisy birds in the underbrush. 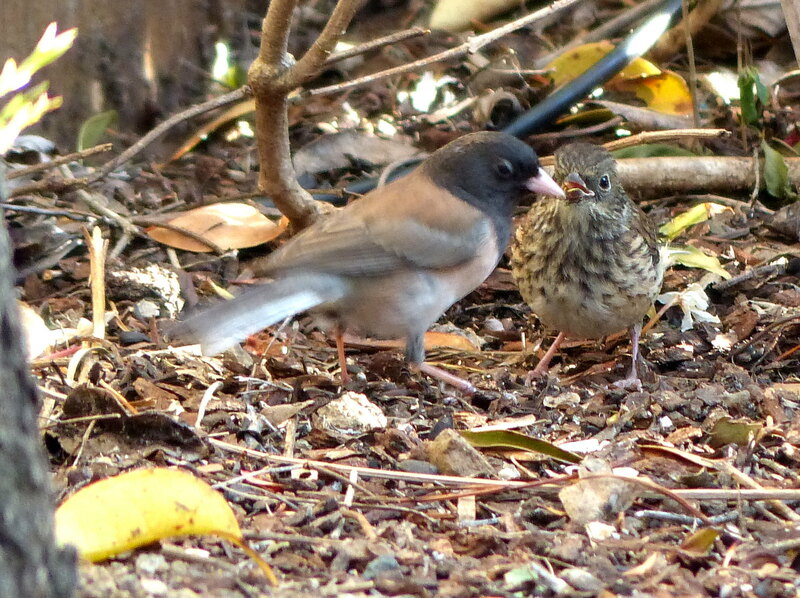 They looked like little sparrows, but were hanging out with two Juncos. Then we saw the adults feeding the little birds. New Juncos! The juveniles are a lot of fun to watch, as they’re not particularly great at flying yet, and still rely on their parents for food. But in all other respects they represent the typically busy and enthusiastic demeanor of the Junco. We also have a Chestnut-backed Chickadee family going in a nest box in the backyard, but the young ones are taking their time fledging. The parents have been zipping in and out of the nest box non-stop for a week or more, presumably bringing food back to the nest. They’ll probably take their first flight this week, while we are at work, busily attending to our responsibilities so that we can bring food back to the nest.